After last year's summer vacation that featured several long days of driving, we designed this trip with bit sized jumps on the travel days. After yesterday's two plus hour jump to Walpole, today featured another two plus hour jump to Lenox, Massachusetts. Tom, Sharon and I had a leisurely breakfast with two other guests at the Inn at Valley Farm. The owner had a long soliloquy about the farm's operations. Leaving the Inn late, Tom went on ahead. Sharon and I made stops at Alyson's Orchard and Burdick's Chocolates. We had a hot chocolate at Burdick's and then walked around Walpole a little. Getting back in the car, we headed south. 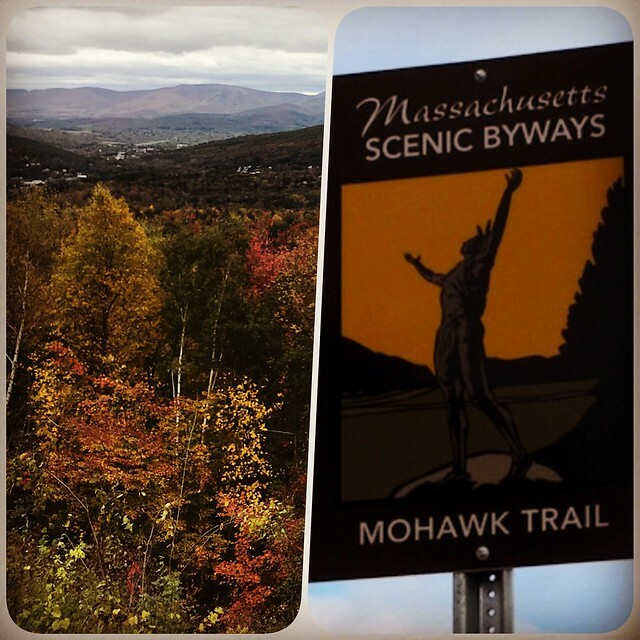 We took the Mohawk Trail Scenic Byway west across Massachusetts. It was a beautiful drive. We stopped in Shelburne Falls. We walked through town, looked briefly at the glacial pot holes and walked across the Bridge of Flowers. We took a very brief drive though Williams College before turning south towards Lenox. We are spending two nights at the Birchwood Inn in Lenox. Tom is spending one night here before he moves on. After getting settled in the rooms, the three of us explored Lenox. We ended up at the Get Lit wine bar in The Bookstore. We had a couple of glasses of wine with the owner [Matthew]. We had dinner at Alta. Sharon had Coq Au Vin, Tom had trout and I had pasta with shrimp. Sharon was very disappointed in the meal. The three of us finished the evening with dessert and coffee in the library at the Birchwood Inn.